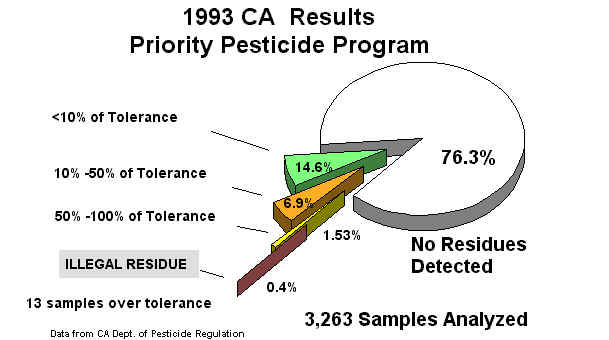 "1993 California Pesticide Residue Monitoring"
This "special edition" of the Environmental Toxicology Newsletter contains the results of the 1993 Pesticide Residue Monitoring Program carried out by the California Environmental Protection Agency, Department of Pesticide Regulation (DPR), Pesticide Enforcement Branch. DPR distributed graphs with these data and we remade them to include the information on fewer charts. The charts may be copied and used on overheads, and color slides of these are also available to Cooperative Extension specialists and advisors through our office (and they are VERY good slides too!). In 1989, DPR started separating the data for organic produce and conventionally grown produce. The DPR report states that organic produce may contain a residue and still be classified as organic if the residue is less than 10% of tolerance. This is to cover accidental contamination or holdover in soils from previous agricultural practice. 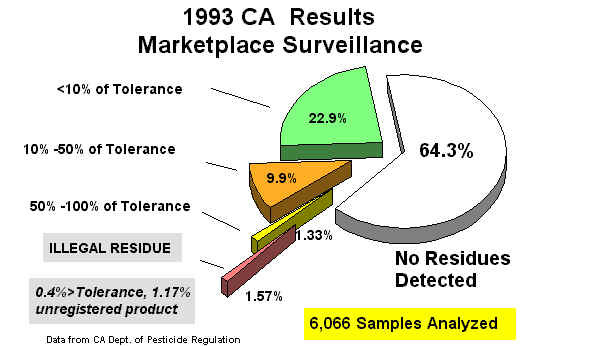 While the sample number for 1993 is very small compared to conventionally raised produce, there was a detection of a residue in one of the 23 samples, at less than 10% of the established tolerance. 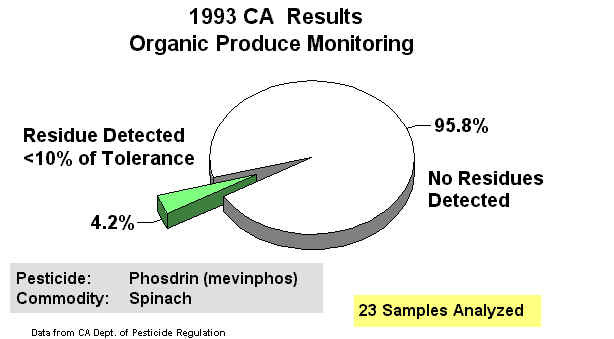 The pesticide detected was mevinphos and it was detected on spinach. We are in the process of collecting the raw data for previous years, and will revisit them later, however the monitoring results are very interesting. 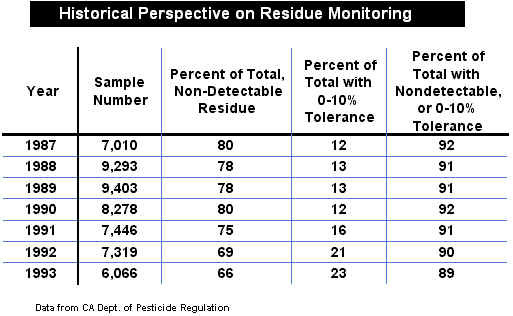 If one were to look at the residue results from conventionally raised produce which was known to have been treated with a pesticide (Priority Pesticide Program Monitoring), 90% would have either no detectable residues or residues 10% of tolerance. For the marketplace surveillance samples, the figure is 88%. Thus, 88-90% of conventionally raised produce could be considered "organic" based solely on pesticide residues. Production methods are of course considerably different and this comparison holds only for the pesticide residues. It is surprising that so few organic produce samples were taken for analysis. 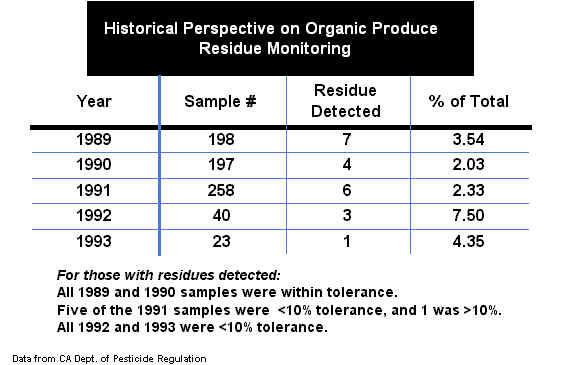 Twenty-three samples is hardly sufficient to get a good picture of the true incidence of pesticide residues on organic produce. In addition, it should be recognized that residue monitoring is NOT directly related to food safety. 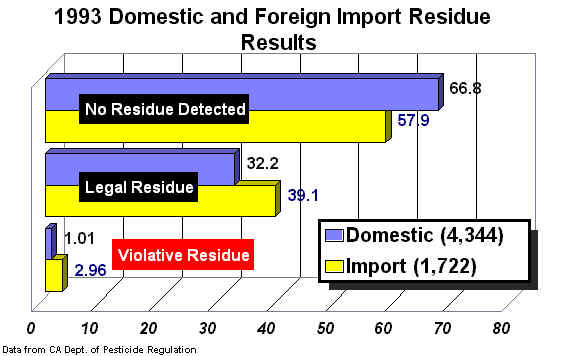 Residue monitoring gives a picture of whether or not "good agricultural practices" are being followed, be they conventional or organic practices. We can say unequivocally that the residue monitoring data shows that is the case for both.